The last few months have been a monsoon of activity here. But finally, the magazine is at the printers! They will be mailed out directly from the printers at the end of next week to take full advantage of savings in terms of shipping time and cost (they get bulk rates), so expect it in your mailbox in mid-April! International orders may take a bit longer. Thank you all for being so patient with us. And for those of you who didn’t know, this was a team effort between us and Kev and Van from grandJDM. It was hard to work with a 15-hour time zone difference at times but we made it! Thanks guys! Here’s a sneak preview at some of the article inside the first issue. Thanks for supporting the old school! This post is filed under: jnc. 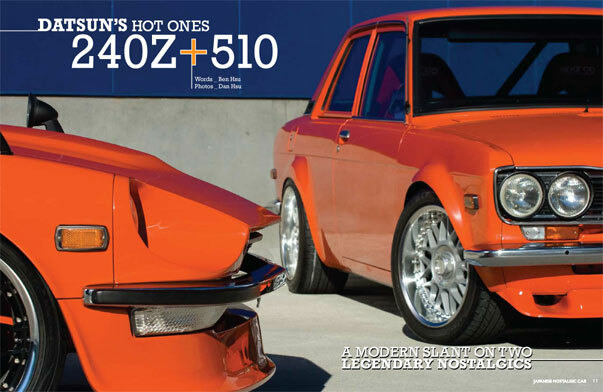 Pingback: grandJDM » Japanese Nostalgic Car Magazine, Coming in April! I made an international order way earlier, but got no confirmation or follow-up emails, is this normal? I’ll be in Japan until the end of April and look forward to reading the magazine once I get back! So I’ve no need to worry? Good then, thanks for the heads up! Sorry for the infrequency of updates. We’ve been working on this solidly for months!